Okay, so I pulled it off! 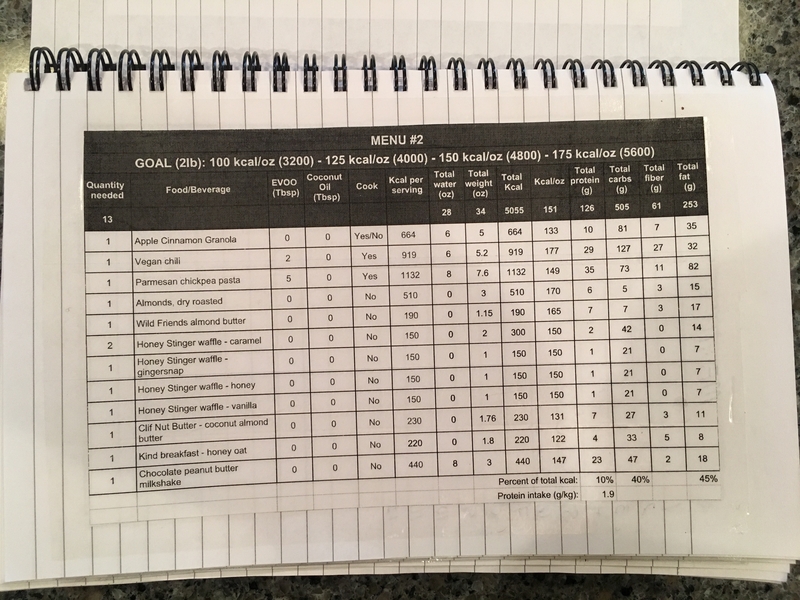 Fourteen 5000 calorie menus within my two pound daily goal for a grand total of 345 pounds of food! How on earth am I going to package all of this up into resupply boxes, you ask?!? It’s actually quite simple. 1. 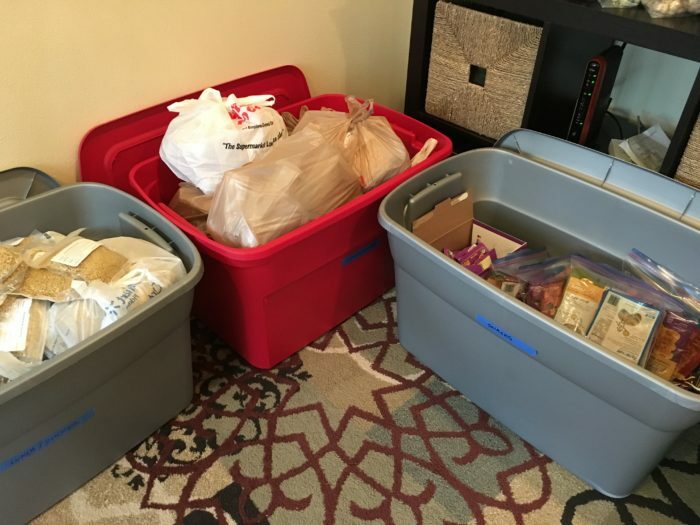 Store prepared and/or purchased foods in dedicated totes with each recipe or food item in its own bag. In and effort to remain environmentally friendly, ask friends and family to save plastic and/or paper bags for you as you can re-purpose them and later recycle without using new bags. The number of bags that would arrive daily at my work desk was quite comical! 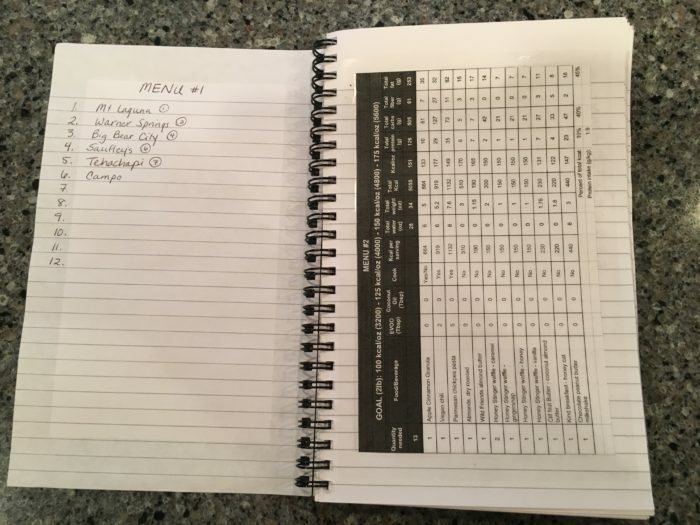 Example of a daily menu including water required, cook /no cook options and nutrition information. Now that you’ve prepared your meals and determined the snacks that you’d like to take along, begin creating combinations that meet your nutrition goals set. This might take some time initially but you’ll quickly recognize which foods make up the best combinations. Choose meals at varying caloric densities. For example: 160 kcal/oz breakfast, 110 kcal/oz lunch and 135 kcal/oz dinner. Choose snacks, beverages and treats at varying caloric densities in the same manner. In the end, the foods chosen should average out to your goal. I found that entering menus into a spreadsheet was more efficient as copying/pasting is quicker than writing each menu individually by hand. Do I expect to follow each menu precisely on a daily basis? Absolutely not! Menus were created to ensure that adequate food will be available to meet my daily goal. 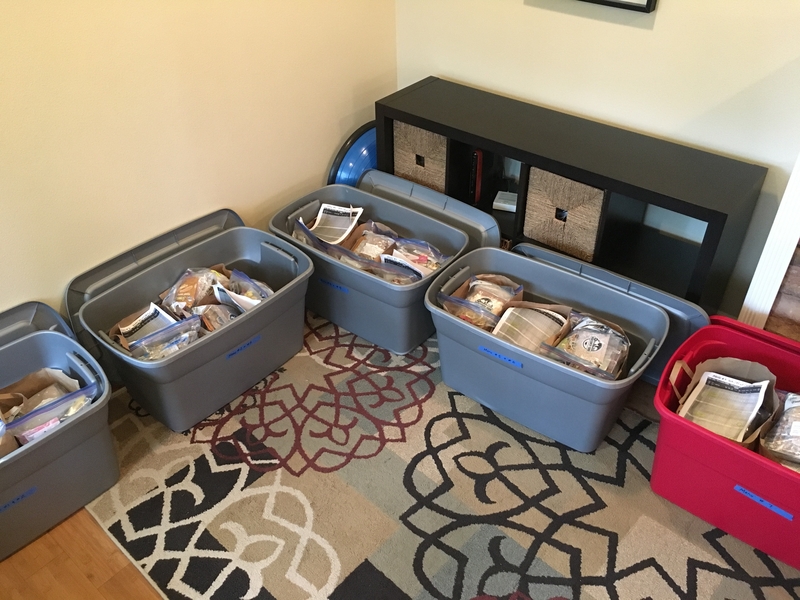 As long as all of the food is consumed prior to resupplying, I’ve met my goal regardless of what order the food is consumed in. Seven day supply at 5000 kcal per day. Success! I found that I had to design menus specifically for this purpose as other menus would not fit in the can. Oatmeal, mashed potatoes, couscous and nut butters tend to be space efficient. Macadamia nuts are not space efficient but calorically dense at 230 kcal/oz! They can be used to replace food that will not fit in the can. Now that meals have been prepared and menus created, t’s time to start bagging them up for your trip. 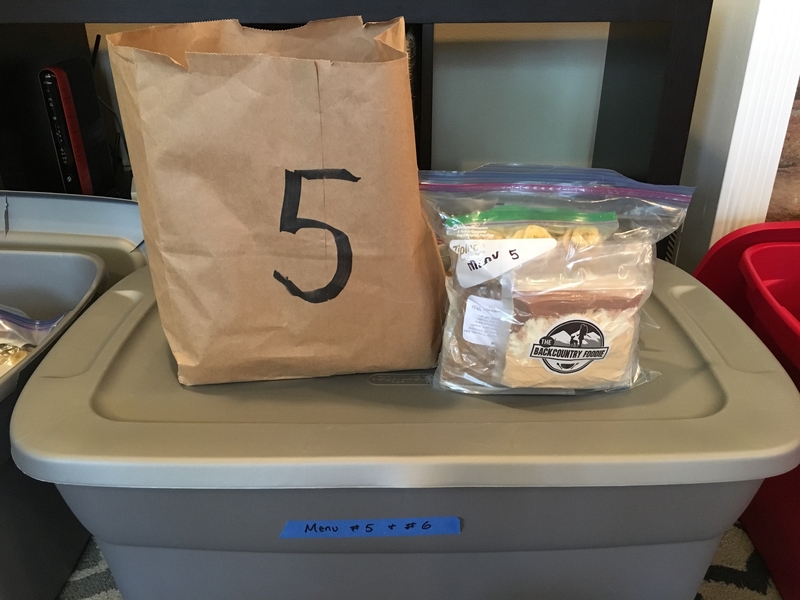 I found that labeling the total number of Ziploc baggies needed per daily menu simplified the loading process. For example, pull the Apple Cinnamon Granola bag from the Breakfast tote. This method will help prevent the room from looking like a tornado hit it! 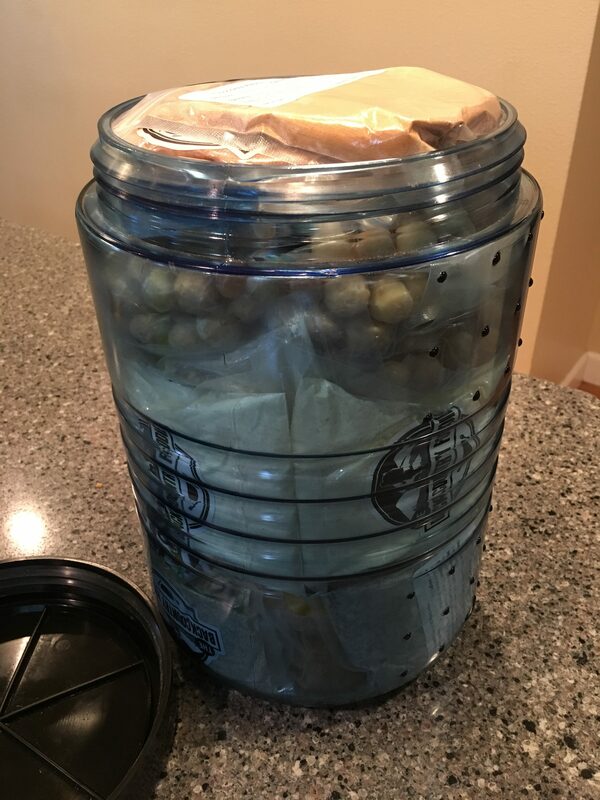 Putting the loaded daily baggies in a paper grocery sack also helps keep the tote neatly organized. Totes are now ready to be stored in a cool, dark, dry place until ready to fill resupply boxes. The preferred storage method is to freeze meals but storing over 500 servings wasn’t realistic in my case. Multiple deep freezers might be in my future! 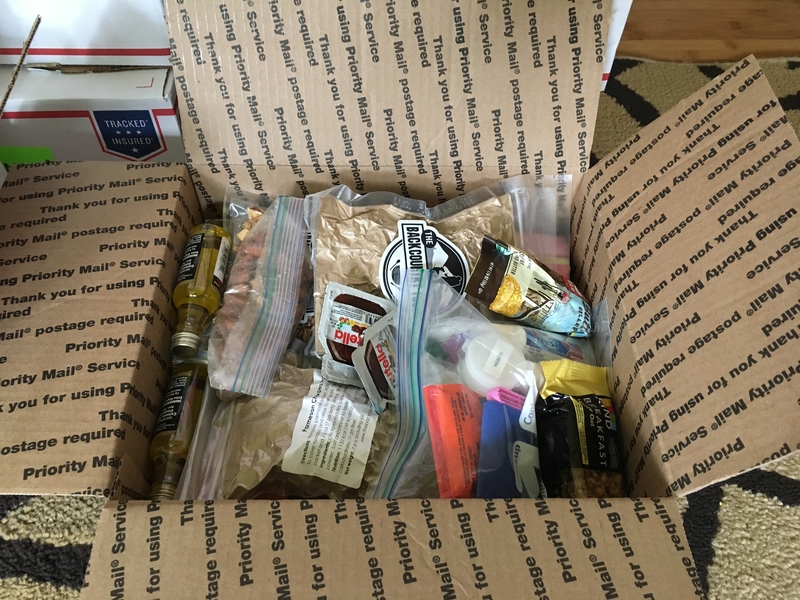 Three days worth of food in a regional rate size box B. This will give you an idea of what size boxes to use and how many that will potentially need to be shipped. I have the luxury of using regional rate boxes, at a reduced cost, as I reside on the west coast. In my case, large flat rate boxes ($18.95 each) hold four daily menus with regional rate ($8-$11 each) boxes holding three daily menus. Using return address label stickers greatly reduced time spent compared to handwriting on the boxes individually. Brightly colored stickers with my last name were used as a way to quickly identify my boxes. 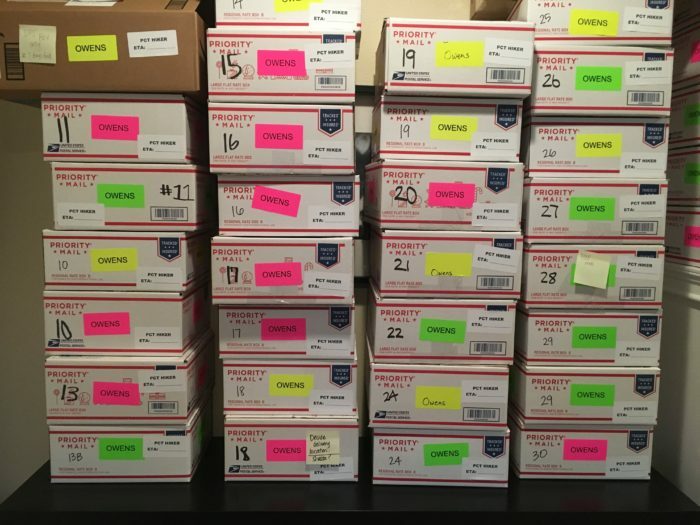 For the PCT, “PCT Hiker ETA” is required on all boxes sent to post offices. Stickers were used for this purpose as well. 8. 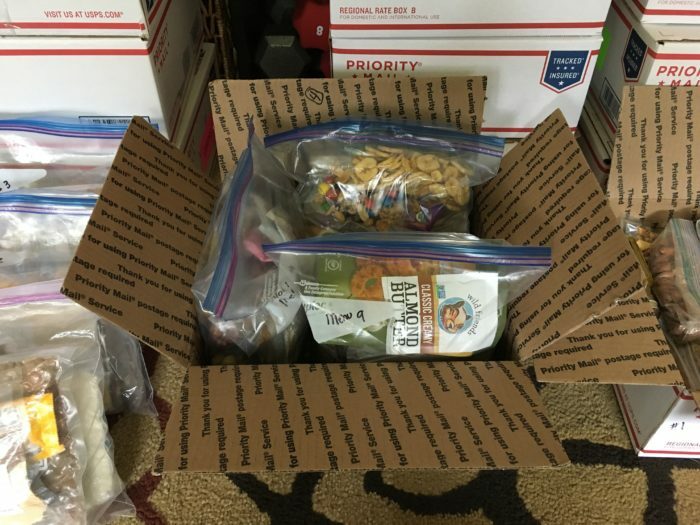 When on trail and ready to resupply, contact your support team and request that the boxes be filled with your preferred daily menus. Leave a copy of the menus with your resupply help as they can review the choices with you and mark down how many have been shipped thus far. This will give you an idea of what’s leftover throughout the course of your trip. Thirty commonly used resupply locations have been identified as possible shipment options. Maybe it sounds complicated due to the number of steps but the method is overall quite simple. With a little bit of organization, the contents of resupply boxes do not have to be boring and can vary over the course of your trek. 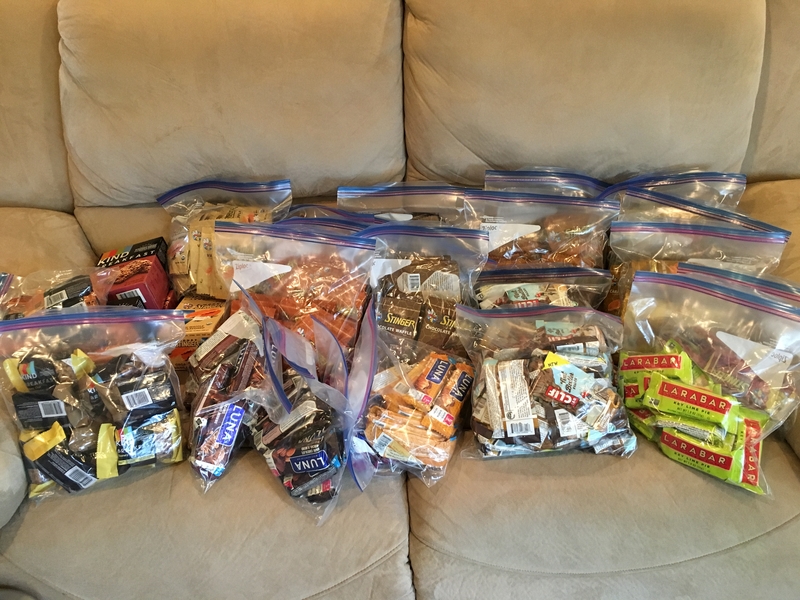 I leave for my PCT thru hike !!tomorrow!! with an early morning start on Sunday, March 26th which is also my 40th birthday. I’m looking forward to opening the first baggie and consuming Menu #1’s breakfast, a tri-berry granola! I plan to post when resupplying to include updates on how the menus fair on trail, taste preference changes and hopefully maintenance of my weight. Pics of my food over the course of the trip will also be posted via my Instagram and Facebook accounts. Wish me luck as now the hard work really begins! Good luck and safe travels! P.S. I love this blog! Happy Birthday, have a great time, Aaron….. Fantastic info here, appreciate these details. Good luck! In reply to everyone’s comments above… Thanks so much for your support and am thrilled that my meal prep methods have been helpful. So far, so good on trail. Week one in the books!